OLDRIGHTIE: Don't Be Liked By Voters. Don't Be Liked By Voters. So It Would Seem, For Politicians Today. It was always inevitable Farage would face a powerful and enormous propaganda machine, put together by the Establishment and no doubt bunged a fortune from Brussels to endeavour to stop him in his tracks. As in all political circles backstabbing, lies, nastiness and extreme jealousies dominate. The old adage about stones and glass houses gets suspended. Even erstwhile supporters of anti federal EUSSR ambition are anxious to join the chorus of vindictive and often personal grudge settling. . All of this, however, misses the point of UKIP's very existence. It has become the sole Party which most reflects the fears and anxieties of those British people who still possess a brain cell. Most of our electorate has been neatly lobotomised by Labours' comprehensive education failed experiment. Where middle class passion for upward social mobility threatened the socialist core vote, this was destroyed by that now infamous nose rubbing exercise that has turned our land into a stricken and overcrowded, third world hell hole, in most of our towns and cities. All the time the EUSSR agenda, abetted by Common Purpose, world government and abject dictatorship ambition, still pursues its need to wipe out National identities. That such a sense of belonging is an essential part of all creatures survival instinct passes these arrogant suppers at the top tables, by. Banquets where only obscene wealth matters. Be it via Union subscriptions, corporate monopolies or tax paid tenures, it matters not. Just as welcome are African potentates, drug barons et al. Only the thickness of the wallet counts for membership of the dining clubs. Where is there any real threat to this burgeoning new world dictatorship.? Well, China, India and Russia offer hope of sorts. All passionately nationalistic rather than empirical in nature. As for Farage's admiration for Putin. Once more he reflects the deep seated feelings of many. A leader nervous of the unholy EUSSR, USA alliance, using NATO as a military platform to bribe old USSR states into siding with expansionary obsession. Is Farage's admiration that misplaced? My take on recent events suggest that the propaganda machine against Vlad is very similar, in a much larger way, to that aimed at Nige. I'd wager a stronger power base for Farage would make him a more welcome representative than any we offer right now. By that I mean Obummer, Cameron, Merkel and Baroness of beauty and intellect, Ashton. Furthermore Ukraine has made many of the EUSSR weaknesses less public, as we head for EUSSR elections next month. Handy that. Throw in the venom and effort directed at Farage and suddenly things take on a nasty taste. I would suggest the following. UKIP, even with the flawed and human Farage at its head is the only possible hope we have of staving off the subjugation of our already heavily compromised freedoms and Nationhood. That the likes of Clegg, Milibad and Camoron escape the vicious scrutiny now levelled at Farage is a typical leading by the nose our Establishment so enjoy indulging in. It is so very sad the likes of the eminent Richard North fails to set aside personal, no doubt genuine grievances, in order to drive a UKIP agenda we so desperately need, is a great shame. My one hope is that we "anoraks" are less important and that an outbreak of anti-establishment common sense prevails next month. Perhaps the already established immigrant base will also fear an overwhelming influx of EU migration. One possibly seen as a possible threat to their Islamic cause to rule the world. Now there's an ironic consequence for anti-EU federalism! Whatever the future, no matter the antipathy towards Farage, who else is there? Where else can we go for some reality? Shock horror that he might be human. After all our political classes are riddled with kiddy fiddlers, expenses cheats, gay and minority positive discrimination apologists and a plethora of self interested greedy chancers. In essence the flotsam and jetsam of human weakness. Next to most of those creatures our Farage really is a man of the people. Politics with a human face. Now that's worth supporting in itself. So swallow personal feelings about the man and get behind his cause. 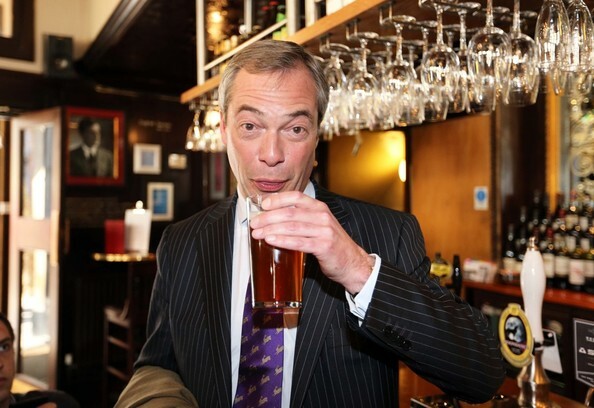 When all is said and done, no matter how unpalatable, he has made UKIP a recognised Party. For that he needs supporting, come what may in May! Hear, hear! So many critics of Nigel but where are they on the media or BBC. Nigel has pulled the issue of the EU out from under the rug. Richard North and Christopher Brooker are unknown to the wider general public, even to those who consider themselves well educated. To make a difference you have to make yourself heard, loud and clear! Thank you both for your comments. The sentiment is gaining significant credibility in the Country which might, just might, weaken the political classes. Nigel did amazingly well last night, I think they'll be much nashing of teeth and hair pulling in Westminster today. I will vote for Ukip at the next two elections,to say voting for them is letting labour in is an insult to the electrol. I will vote with my conscience and my heart for the sake of my country.